Of course we go through our laundry list of fascinating transcription topics, but nothing gets a conversation moving faster than mentioning StoryCorps. And with good reason. In just seven years, StoryCorps has grown from a modest startup with big ambitions into a full-on national non-profit movement. WHAT, IS THAT LIKE THE PEACE CORPS OR SOMETHING? Well, yes, kind of. 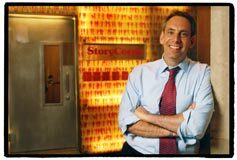 StoryCorps is a public service, but its mission is the recording and preservation of the stories of everyday Americans. It is one the largest, most unique oral history projects, and also one of the first and largest born-digital oral history collections — comprised of over 50,000 interviews, recorded in all 50 states and Puerto Rico. It all began with one recording booth in NYC’s Grand Central Terminal in 2003. Now, in 2010, StoryCorps has recording booths in Milwaukee, Nashville, Atlanta and San Francisco, plus two MobileBooths (housed in nifty fifties Airstream trailers) that have traveled to more than 100 cities in 48 states. The grand total of interviews? Well over 50,000 and counting. The compact recording facilities provide a professional-grade environment for ordinary people to share and listen with an end result of broadcast quality audio on a CD they can take home. The interviews are in turn added to the StoryCorps Archive, housed at the American Folklife Center at the Library of Congress. 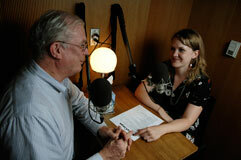 You can hear specially selected interviews Friday mornings on NPR’s Morning Edition. These stories are also available for listening on the StoryCorps’ site, or subscribing to the their podcast. Or, listen to some on the player below! That’s our company motto, coined by Sandy, Audio Transcription Center’s founder and president. Naturally for us, working with StoryCorps is a perfect fit. And boy, do we love working from that pristine digital audio — although, many a transcriptionist has been moved to tears or laughter (frequently both) while working on SC interviews. Just in time for Mother’s Day this year, Story Corps’ new collection, Mom, hits the shelves of bookstores nationwide April 15. Previous Previous post: New Name. New Website. TTC is now ATC.